Google AdWords - Blackrock Networks, Inc. It's time to make sure potential clients can find you on Google! Google lets you publish text ads next to Google search results whenever a user is searching for your products or services. It's a great way to reach thousands of potential clients, at exactly the right moment, when they actively searching for your type of business! Quick and easy. Create your advertising campaign online within just minutes. Get targeted traffic. Your ads appear next to search results when a user searches for words of your choice. If you are a florist in NY you can choose to show an ad next to the search "NY flower delivery". Pay only for clicks. You pay only when someone shows interest in you by clicking on your ad. Control your costs. 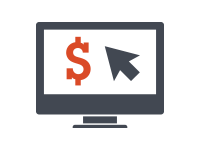 You decide how much to pay per click, and determine your budget. Enjoy Powerful reporting AdWords lets you know your results at all times.